Few people seem to be too obsessed with Modi. It could be the day of their death but yet they won’t forget to spew some lies against Modi while breathing their last. This is a trend that is rapidly getting popular among the hate-mongers and lie-peddlers in our main stream media as well as a bunch of known faces that routinely appear whenever a discussion on Modi is skirted. One such human being is Mani Shankar Aiyar. Like a round robin game of mudslinging, it invariably always Modi and the topic of Gujarat riots that features in Barkha Dutt’s programs in NDTV. As if the lady can’t just conjure up her existence without Modi, she habitually brings Modi into her programs and allows morons like Mani Aiyar and many alike to openly articulate lies and that too at blatant insanity. One such spectacle went past yesterday at her ‘We The People’ episode. 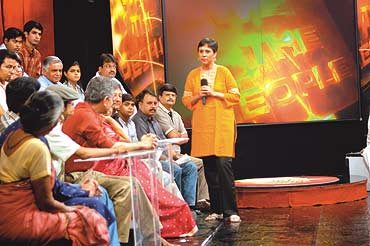 Though she had many in the panel to talk about Modi’s latest delineation of secularism as ‘India First’, she let a large chunk of the air time to professional liars and storytellers to open their mouths and vomit lies about Modi, his governance, Gujarat as a rising state. Probably that’s what suits her as a paid journalist and the channel NDTV to continue getting their fat rewards from a bunch of crooks, which unfortunately are misgoverning the nation for last 9 years. The pro Modi debaters were either not given opportunity to rebut the lies that the rogues were spewing or if given were always allowed to be hijacked by the same set of morons, without even letting people like Nirmala Sitharaman to complete her sentence. Though I never found any merits in the words of those clowns who were trying their best to prove Modi is wrong for his idea of equating the nonsense called secularism as nothing but the nation first, the hate-mongers were allowed to carry on with their absurdity in the name of debate by Barkha. And didn’t the mad rush was expected to start with Mani Aiyar? Before we move forward, a sycophant like Mani Aiyar needs some accolades. Perhaps his life is all about crawling on the ground and licking the footwear of Gandhi family members, even if that is of a person 30 years younger to him. His shamelessness deserves some mention in detail since after his prolonged rear licking he was kicked out of the sports and youth affairs ministry, the moment he opposed the idea of organizing the CWG. For the first time he tried to do something other than licking some Gandhi family spit and he was kicked on his groins unceremoniously. But would you believe, he rather been seen revolting for such treatment, he got down on his knees immediately and continued with his sycophancy. Had he been equipped with little pinch of self-esteem, he would have at least stopped worshiping the Gandhi family the way he is seen doing from his birth. But alas, the clown badly lacks self-respect and that is why he perhaps reacted like a leech sprinkled with salt, the moment Mrs. Setharaman brought the topic of Sahabano. Could the slave tolerate his master’s duplicity and faults exhibited so openly? And that’s what precisely he did. While a lot of others waited with patience for their turn to participate in the debate, the boot licker continued his blabber, after repeated request from Barkha to cut short the nonsense. Now the essence of the topic that was discussed in WTP and the manner in which toadies were given a free run, looked little pre-formulated. First thing, for anyone who calls himself a true Indian, should have no qualms in having the country put above everything else, let alone secularism. I was amused a little when the lady who is a Muslim and claiming to be the finest Indian one can find, showed her reservations for the same. For her, a religious ideology is purely a personal choice and none should tutor on where to put it on the priority list. Had it been Rahul instead of Modi giving the same lecture on secularism, I bet my last penny, the same woman would have gone gaga about Rahul’s vision and his inclusiveness. Such crooked these paid panelists are. The idea was not to have a healthy debate on the merits of the lines uttered by Modi but to project him at fault with absurd reasoning. To couple it, her lies about how Muslims are still sidelined in Gujarat were as vibrant as the vibrant Gujarat itself. Though the lady might be caring nothing for the Gujarat riot victims, she vended untruth at the top of her voice as if she had the chance to meet each and every Muslim of the state. She was so convinced with her lies that she never care to listen to a young girl from Gujarat who tried to rebut her filth with facts and data. The sorry part of the entire discussion was the valid point raised by Mrs. Seetharaman on her introductory lines and how this fact was never debated further. Wasn’t the word secular getting added to our constitution is an afterthought? We were only a sovereign till a mother-son due hoodwinked a lot of people and our constitution to call for emergency. To felicitate thugs, scoundrels and rogues in Congress, people with some maturity and sanity were put behind bars so that Indira Gandhi can have her way after rigging the Allahabad assembly polls. It is during emergency that this highly dreaded and misused word was added to our constitution. Now to call this as an idea of our founding fathers to see us grow as a secular nation is not only jumping the statement but also an attempt at deceiving the nation. Outright deplorable entities like Sanjay Gandhi and Indira Gandhi could be founding fathers for sycophants like Mani Aiyar but I have an objection if someone tries to tell me that these kind of felonious characters were the only ones that were envisioning India. I object if my nation is attached with absolute crooks as its founding fathers. The stooges who clean the Gandhi household toilet bowls with their tongues could fancy even the yet to be born kids of Rahul Baba as the founding fathers of the nation but for us, it is an insult to be told how Sanjay Gandhi with his equally notorious mother instituted the first blocks of a developing India through emergency. And boy didn’t Mani Aiyar convoluted like a pregnant cobra in defaming Hindutwa and every Hindu centric organizations? And in fact he was the most prepared among the congregation of Hindu haters in the studio to spill the rot. What else can explain the truck load of books he was carrying to attend such a silly debate program and not only that, he had the audacity to read paragraphs after paragraphs without showing any courtesy to waiting speakers. Though what Vir Savarkar said about Hindutwa and Hindu Rashtra is disputable but to narrate those lines in context to NaMo’s India first utterance is not only out of place but also a systematic approach to show all Hindus in bad light. This is appeasing politics at best when one wants to find out fault in Hinduism even when the discussion is about latest cryogenic test failure. And how laughable it was on the part of Mani Aiyar to accuse BJP of hypocrisy since they never tried to erase the word secularism from our constitution, when they were in power. Can I ask Mani, on the same line, why Congress is cribbing about one BJP policy or the other for every scam of theirs? If he finds erasing something from our constitution is that easy an act then why didn’t the thugs in Congress abolished the policies which were so erroneous, as per the grey heads of the party? Mani is very Funny. He is always ready to have the droppings of Gandhi Family as Pasta for his Nasta. That too original Pasta. Hybrid Pasta is had by our Spineless Rajput who goes by the name of DigVijay.